weekly programme with a wonderful array of complimentary activities is organised in Larnaka every winter for tourists staying in licenced hotels, apartments and agrotouristic establishments within the Larnaka region. 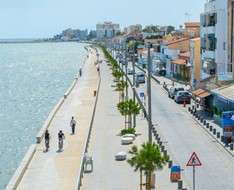 The programme runs from November 1, 2018 - March 31, 2019 and has been created by the Larnaka Tourism Board, the CTO and Local Authorities of the region to offer a jam-packed timetable with something different every day of the week. The week starts with a birdwatching and basket weaving session at Voroklini Lake on Monday morning. On Tuesday, you can enjoy a full day out at the unique Mazotos Camel Park, whilst the temperatures in Larnaka are perfect for taking a walking tour of the town on Wednesday, complete with professional tour guide. Thursday’s activity is a trip to the village of Athienou for a visit to the Kallinikeio Museum and the restored Flour Mill and for some halloumi making at the restored Father Kallinikos Stavrovouniotis House. On Friday you take another guided tour - this time of the local workshops, where traditional crafts are practised. Saturday brings a second excursion to the picturesque villages of Lefkara, Kato Drys and Skarinou (see note below), where you will discover there is plenty to see and do including wine tasting and traditional product demonstrations. The activities are all free of charge upon presentation of a voucher issued by the hotels for their staying guests. All the activities are available on a ‘turn up and enjoy’ basis except for the two village excursions which require one day’s notice.